One of your astronauts is stranded on Mars. The rest of his crew is on their way back to Earth. How the heck do you turn the crew around fast enough to rescue the astronaut before he starves to death? Donald Glover has a plan in a new clip from The Martian—but it’s nuts. In the film, Glover plays Rich Purnell, and astrodynamicist who pitches this wild plan to Teddy Sanders (Jeff Daniels), the head of NASA. According to Purnell, the plan could work but—it doesn’t seem like everyone is too excited about it. Check out the clip. Do they use that plan in the movie? I don’t want to spoil it, but you can probably make an educated guess. Besides the uber-nerdiness here, I love that the clip highlights the insane supporting cast in this movie. Glover and Daniels, of course, but Sean Bean, Kristen Wiig, Chiwetel Ejiofor and others. And from the photo above, you see star Matt Damon, Jessica Chastain, Sebastian Stan and Kate Mara. The film is stacked. The Martian, directed by Ridley Scott, opens October 2. However, it premiered at the Toronto International Film Festival on Friday and got an avalanche of positive reviews. That’s incredibly encouraging considering Scott hasn’t done a universally loved film, in any genre, in roughly a decade. If you want to know more about the film, and specifically some of the science involved, check out this write up. 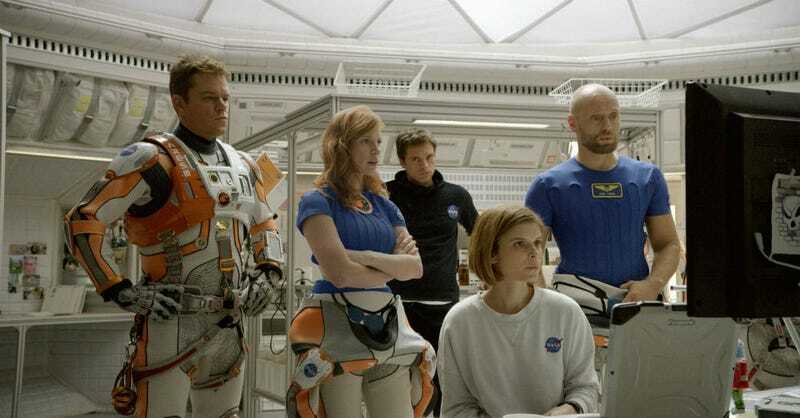 NASA and Matt Damon Told Us Why The Martian Is "a Love Letter to Science"